It’s super important to always eat high-protein breakfasts. 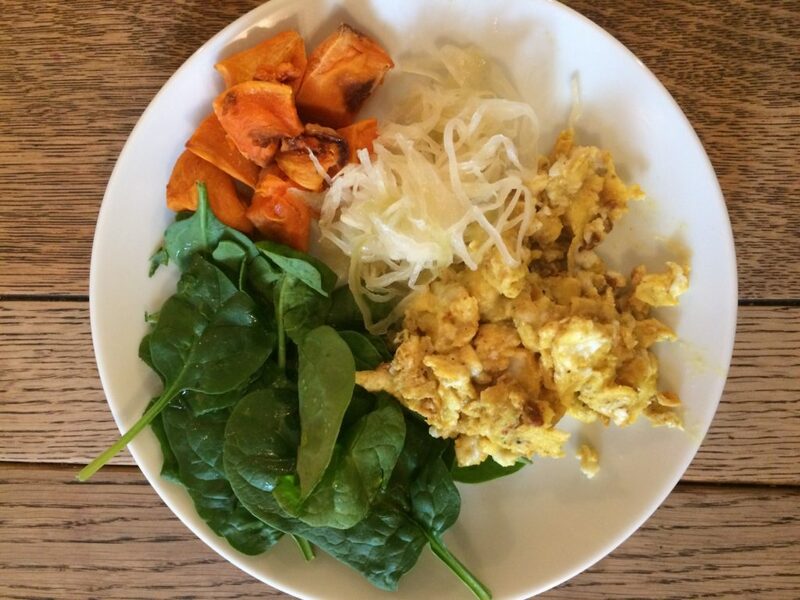 Protein needs to be the focus at breakfast time and breakfasts with vegetables are even better. 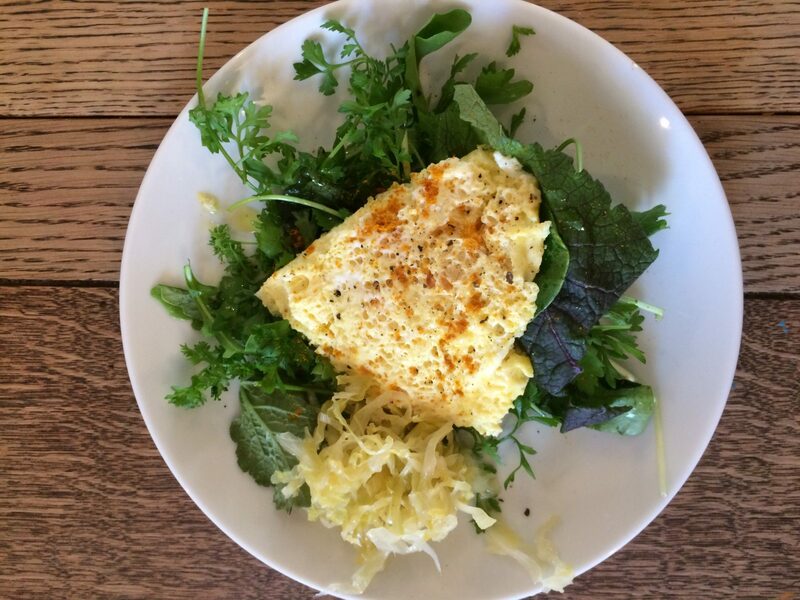 Roasted sweet potato leftover from the day before, raw spinach drizzled in extra virgin olive oil, “golden” scrambled eggs (made with turmeric) and sauerkraut. My “Nut and Seed Porridge” is a cold breakfast made of nuts and seeds. 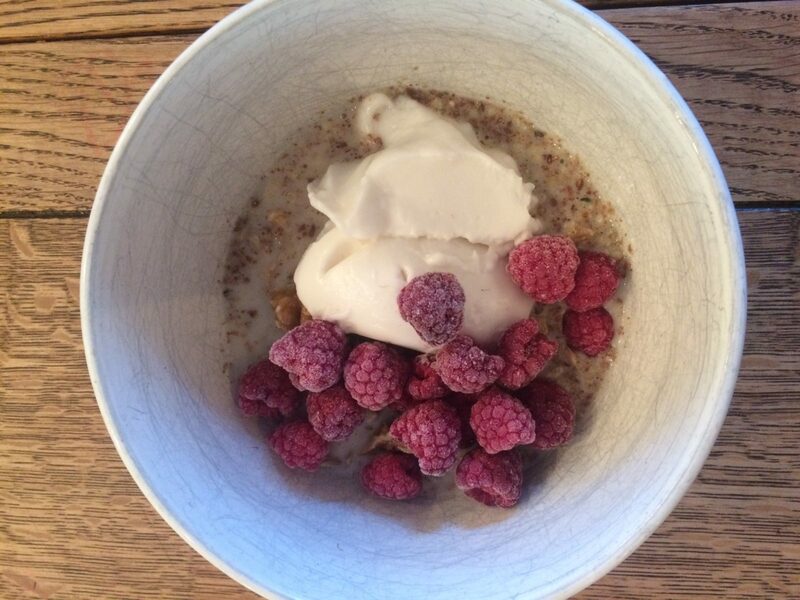 I added some collagen peptides for extra protein and a dollop of unsweetened coconut yoghurt, as well as some frozen raspberries. You can also add turmeric to this and sometimes I add goji berries. This is one of my most common breakfasts. 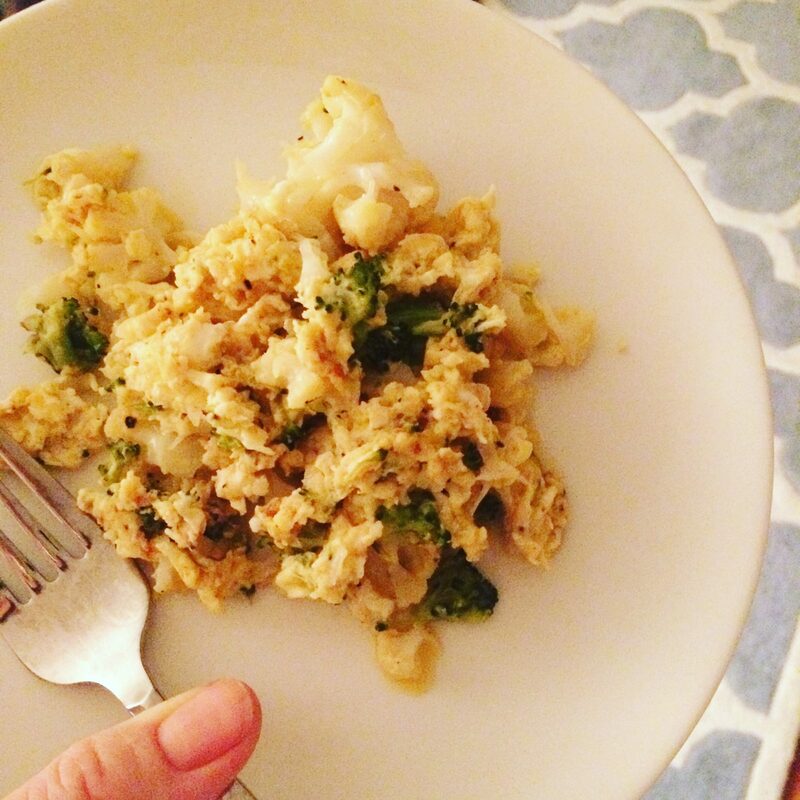 It’s simply leftover veggies from the night before scrambled into a couple of eggs, turmeric, salt and pepper. Voila! Healthy and delicious. 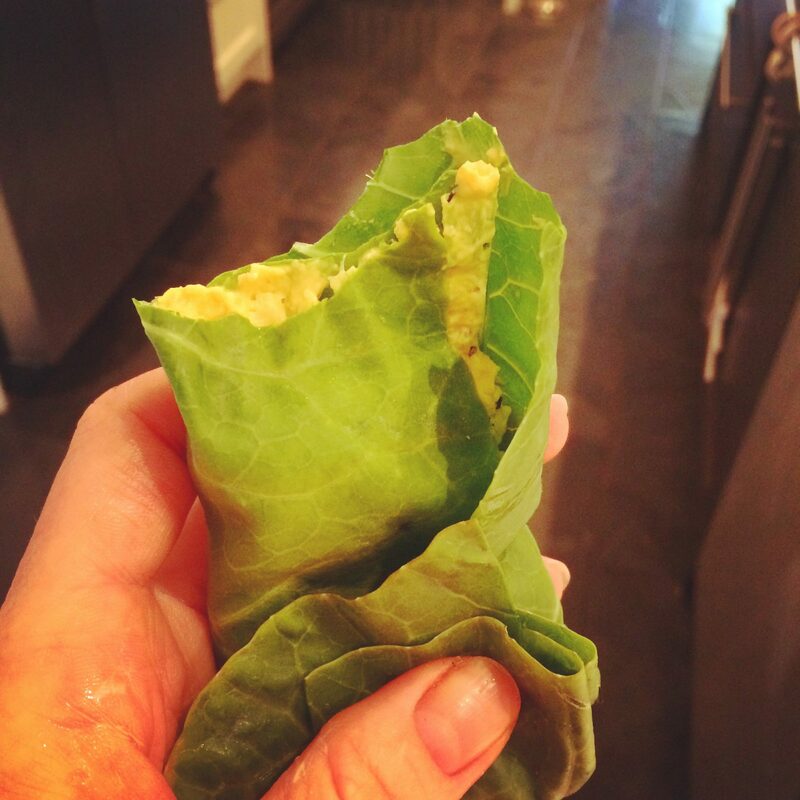 Collard green wrap filled with my “chickpea smash”, which is a combination of canned chickpeas, mayonnaise, turmeric, green onions, salt, pepper, broccoli sprouts and avocado. 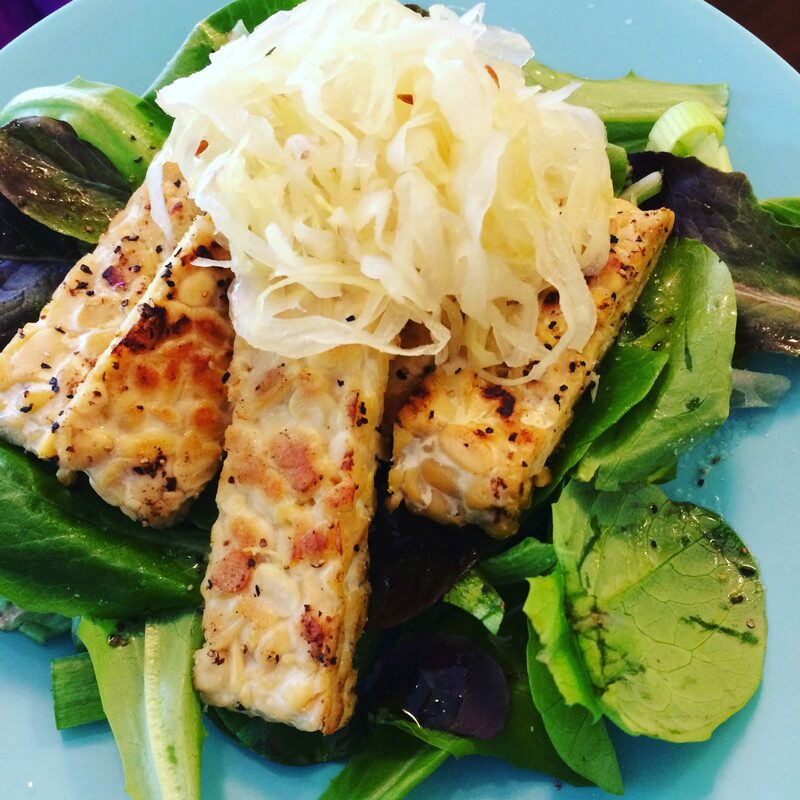 Seared organic tempeh with salt, pepper and lemon juice on a bed of dark leafy greens dressed in olive oil, salt and pepper and topped with sauerkraut.To super-charge the nutrition factor in this I could have added some broccoli sprouts (or any other kind of sprouts). This was whipped up on a day I had no childcare so I was “stay-at-home-mumming-it”. I made a double batch of omelette, cut it in half, gave one to my 2 year old and one to myself. I placed mine on a bed of dark leafy greens that were dressed in olive oil, salt and pepper. I also sprinkled some turmeric on top of mine and added a side of sauerkraut. 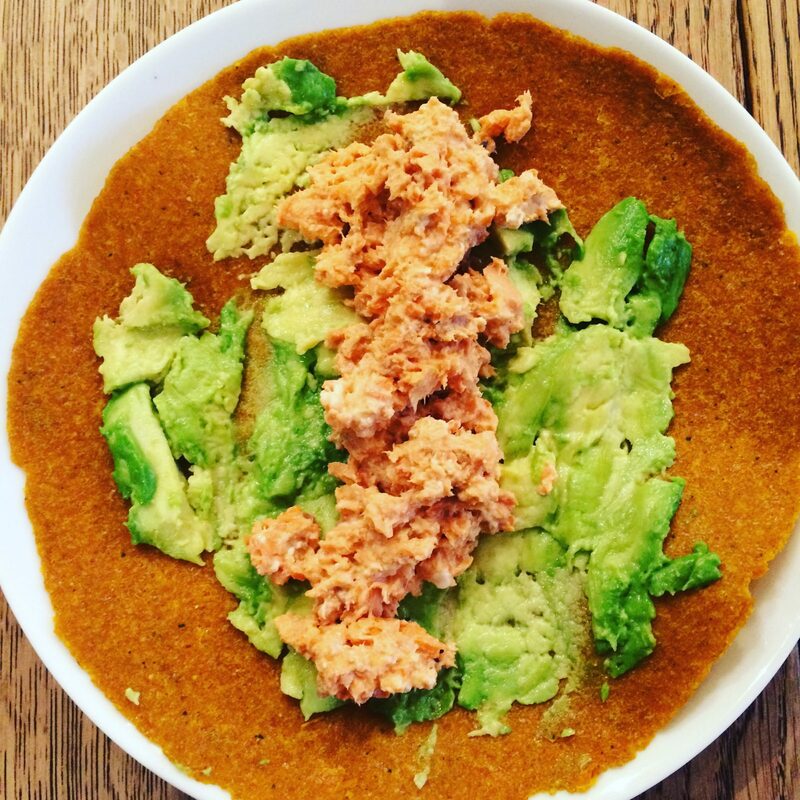 This was wild canned salmon on a turmeric wrap by the brand Live Organic. 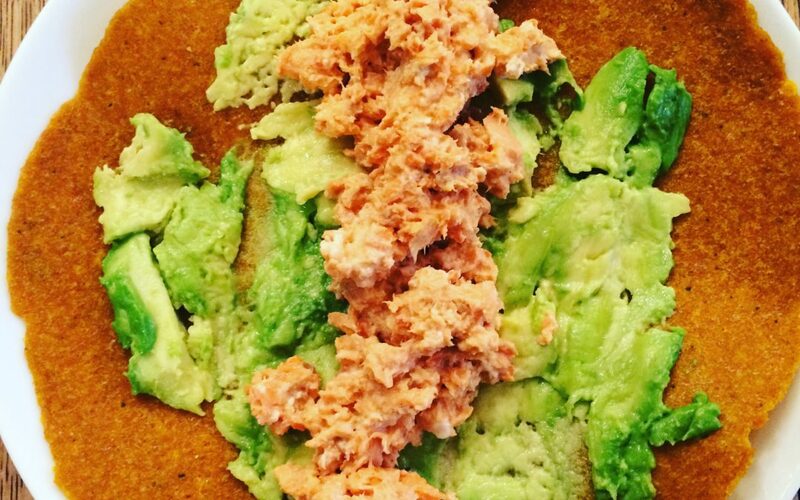 I mixed the salmon with some Chosen Foods mayonnaise, salt and pepper (in hindsight I should have put some turmeric there too), and put it on the wrap on top of some avocado. Some sprouts, or even dark leafy greens would have amped up the nutrition-factor in this lunch, too. This was a super simple and quick lunch as I was on a time crunch. Healthy eating doesn’t have to be complicated! 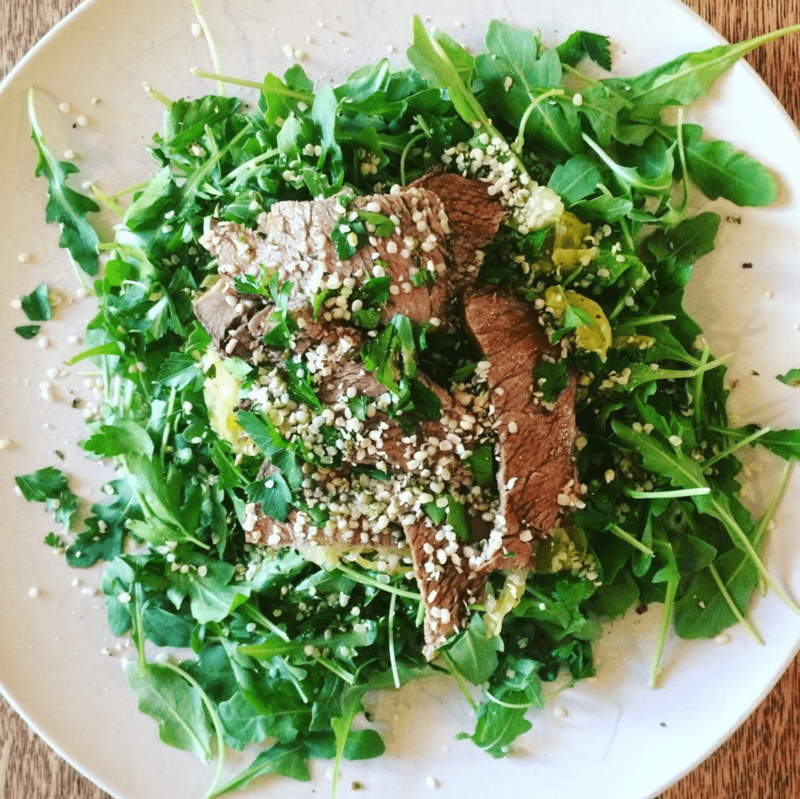 This was just leftover roast beef (grass-fed) on a bed of arugula and sauerkraut, topped with hemp seeds and some olive oil. To make it more interesting I could have added cherry tomatoes, cucumber, chilli flakes and avocado. 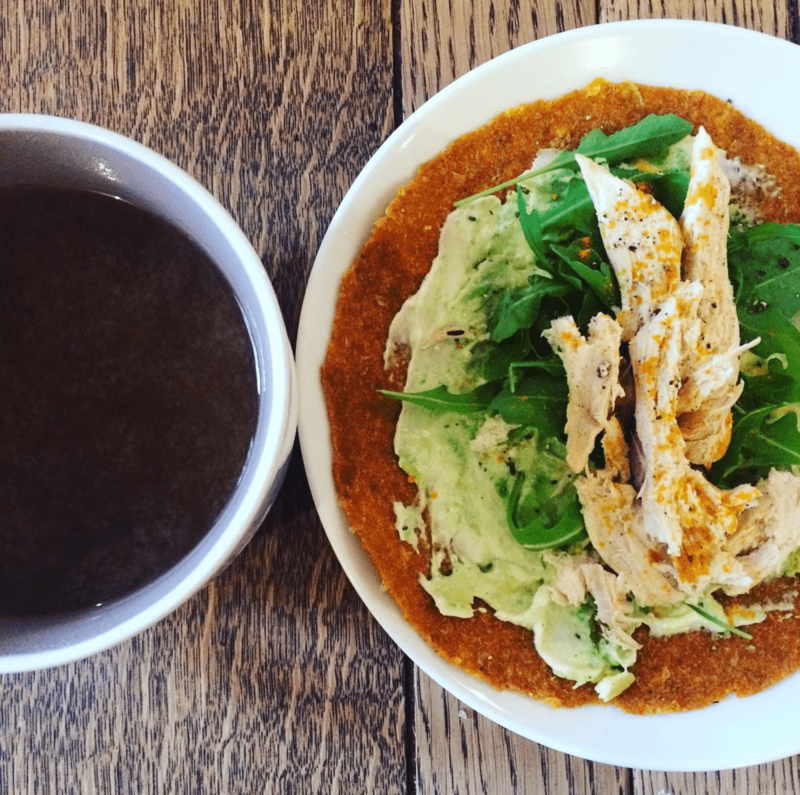 This lunch consisted of a flax wrap by the brand LIVE, filled with mayo, avocado, chicken, arugula, turmeric, salt and pepper (I would have added sprouts if they’d sprouted in time! ), and a cup of miso soup for some fermented goodness. There’s nothing easier than using the crockpot! This was a chuck roast that was made in the crockpot. 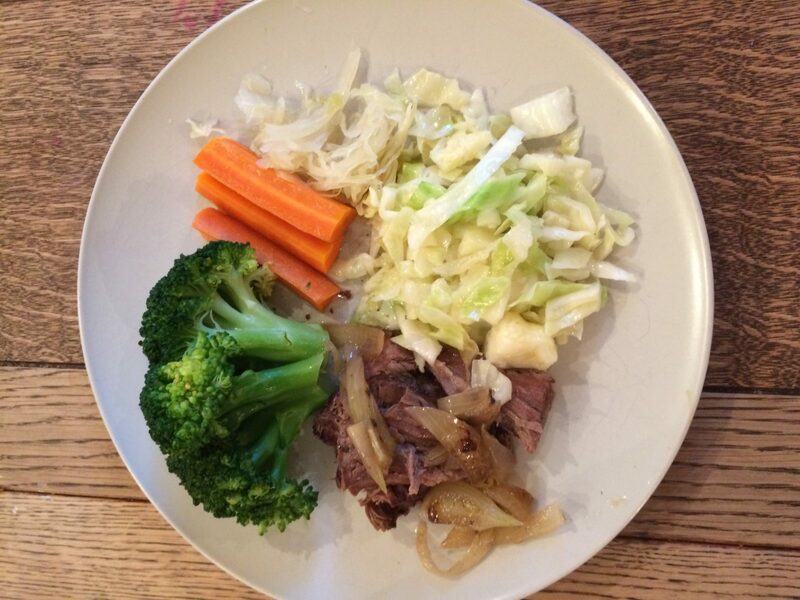 I set it and forgot about it then added some steamed broccoli and carrots, a side of sauteed cabbage (in butter and garlic) and some sauerkraut. 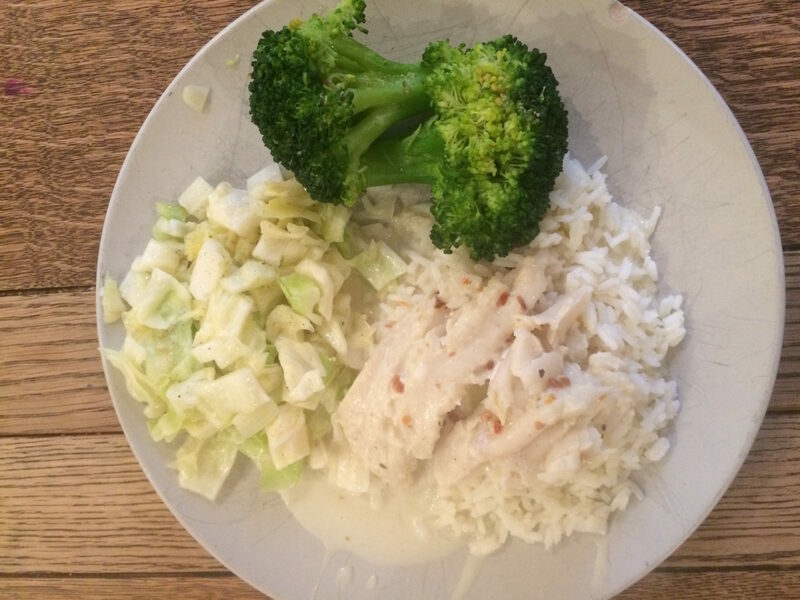 This was a simple, but delicious dinner of sauteed cabbage in butter and garlic, steamed broccoli with butter and a delicious fish made with full-fat coconut milk, chilli flakes, bay leaf and garlic on a bed of rice (usually I use black rice, but white is what I had on hand. White is actually quite easy on the digestive system and – although not brimming with nutrition – I also simply like the taste of it!). 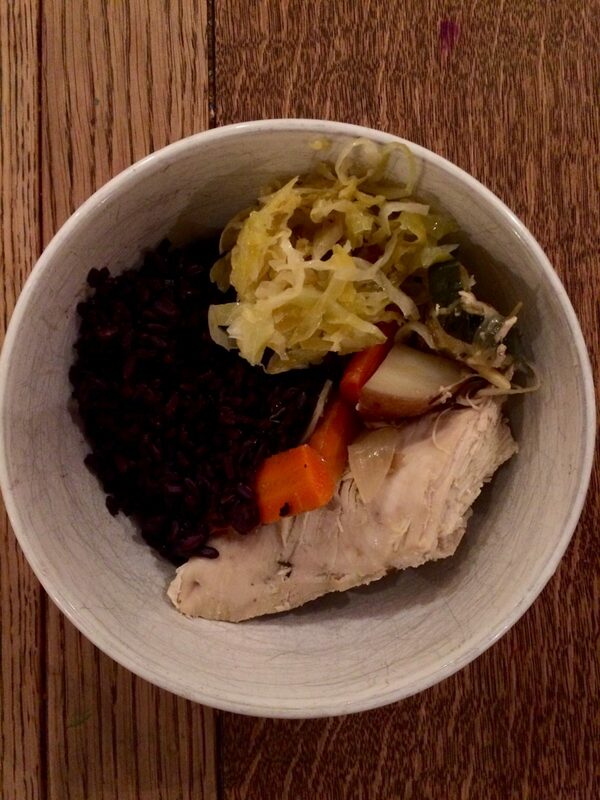 Not the best photo, but this was a healthy dinner of black rice (rich in anthocyanins), roast chicken, veggies (carrots, onions and potatoes) and sauerkraut. 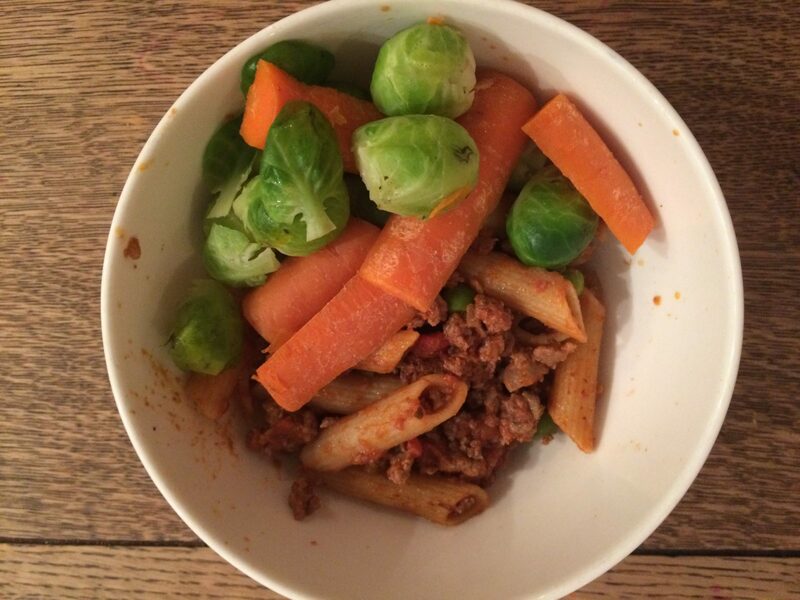 This was a bolognese made with peas, grass-fed beef, gluten-free pasta with some steamed Brussels sprouts and carrots on top. I usually add more veg to my bolognese, things like mushrooms, chopped broccoli, red peppers, even chopped kale. 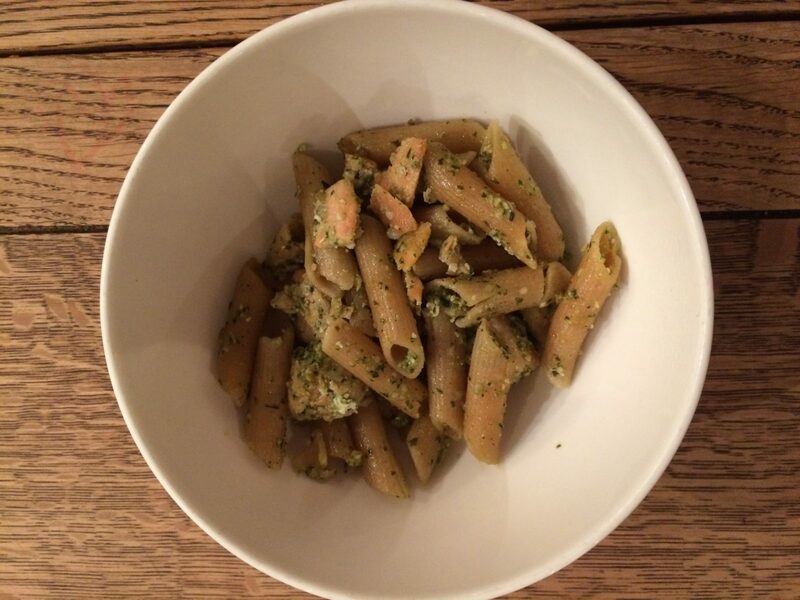 This was gluten-free pasta with my nut-free and dairy-free pesto sauce and wild salmon. I also ate a side of steamed broccoli and carrots with this dinner. 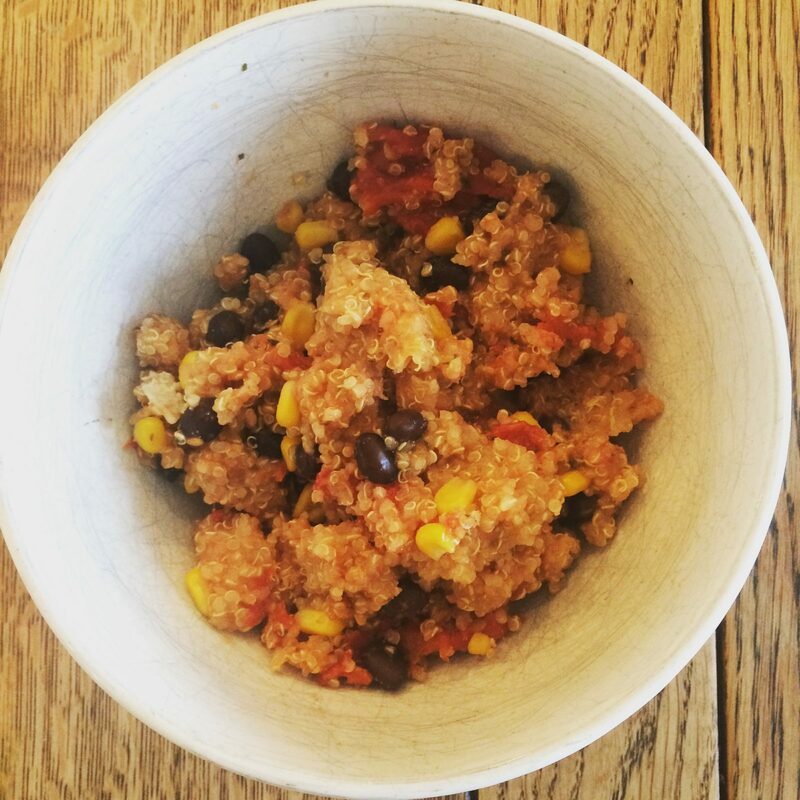 I made this dinner in the slow cooker by combining quinoa, black beans, corn, tomatoes, cumin and other spices. I actually did add chicken but by the time I went to eat this all the chicken had been consumed already (this was leftovers). I usually add some cilantro on top as well as some hot sauce.